The fishing changes allot this time of year as the weather slowly cools down in November. 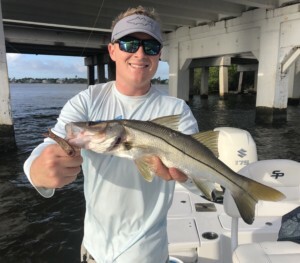 The snook have moved further inshore back in the St. Lucie River where they hang around structure such as bridges, seawalls, docks, and mangroves. The big keeper snook are caught mostly along the river bottom under the bridges. The best baits for them are “diving baits” that will swim down to the bottom near the bridge abutments. Croakers have become my favorite diving bait. To catch croakers, we fish around docks with a small hook and weight. We use 60 or 80 lb. leader and 6/0 circle hooks through the nose of the croaker and cast them gently against the up-current or sides of the abutments. Let them dive down and stop at the bottom. Make sure your drag is set very tight and hold on! For lures, we have caught the big “bridge snook” jigging DOA BaitBusters and Bucktail Jigs slowly along the bottom. As the water temps go down, the big snook love to sit belly-down on the bottom 10-15 foot depth. In the Indian River, we start to see more redfish at the Causeway bridges. Big shrimp and greenies work for them. The redfish and trout can also be caught along the mangroves and flats. We drift downwind while casting downwind in 2-3 feet of water using “Giles Jigs”, DOA CAL Jigs, spoons, and topwater plugs. When fishing for big trout, being “stealthy” is very important, so wade-fishing is a great option in the Indian River. The Spanish mackerel should start schooling up off Peck’s Lake Beach for fun with the family. My favorite mackerel lure is the Gulfstream Flash Minnow in chartreuse green color. The tube jigs and Got-Cha plugs work great also. For fly-fishing I use chartreuse Clouser flies with an intermediate fly line and super-fast stripping. Mixed in with the mackerel are bluefish and jacks. 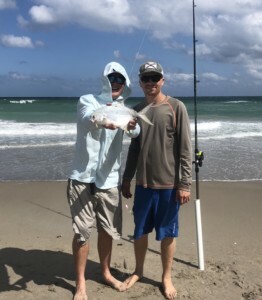 November is usually the start of the pompano fishing season for surf-casting from the beaches, jigging the causeways, and sight-fishing the flats. Whenever cruising the river, look behind you for “skipping pompano” and have a rod ready.